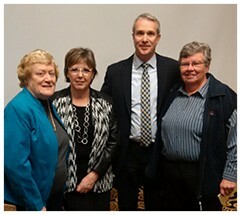 For her 30 plus years of service with OFSAA in a variety of capacities, DIANA RANKEN (far left) was recognized in a warm moment at the most recent Representatives’ Council meeting in Toronto. Diana has moved into full-time retirement but she will still oversee all matters concerning TRYDay. All of us wish her nothing but the best and we extend our deepest gratitude for all of her tremendous contributions to OFSAA and high school sport. Those of us at School Sport Canada would also like to say thank you to Diana for her contributions to school sport over her tenure. Enjoy your retirement Diana.